MOSCOW (Sputnik) - The calls to expel US Ambassador to Germany Richard Grenell after his remark about support for European conservatives are "unjustified and ridiculous," Roland Hartwig, the vice chairman of the right-wing Alternative for Germany (AfD) party faction in the country's parliament told Sputnik. 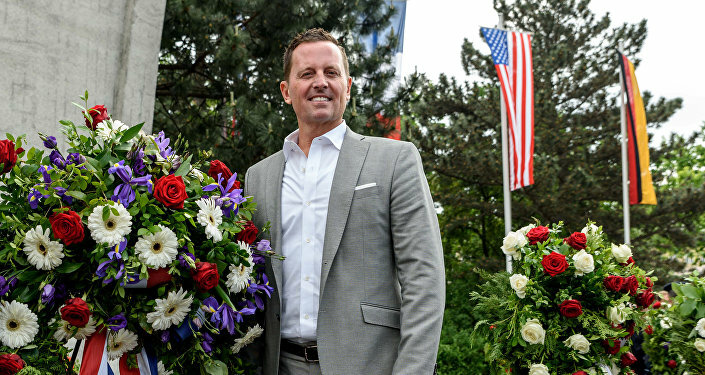 "Richard Grenell´s statements to Breitbart reflect his personal views on the current political development in Germany and in Europe… Calls to expel him from Germany following his remarks are absolutely unjustified and even ridiculous. They powerfully demonstrate the high degree of intolerance shown by many political leaders in Germany with regard to different opinions," Roland Hartwig, the vice chairman of the right-wing Alternative for Germany (AfD) party faction in the country's parliament said. Grenell, who took up his post less than a month ago, has provoked a backlash in Germany after his interview with the right-wing news outlet Breitbart, in which he said he wanted to "empower" conservative forces in Europe. Following his statement, Sahra Wagenknecht, the co-chair of Germany's Left Party (Die Linke), called on Washington to withdraw its ambassador. The politician added that he did not expect the interview of the diplomat would have any impact on the current relations between Germany and the United States.